Suspended wire window kits make the perfect point of sale display. Our wire cable display systems are ideal for use in estate agents, retail showrooms, opticians, hairdressers, museums and exhibition stands. You to combine poster holders and literature dispensers with graphic panels to create incredibly powerful retail displays. We stock a range of suspended cable display kits with a variety of fixings; wall to wall, floor to ceiling and floor to wall, as well as rotating window displays and freestanding cable display systems. 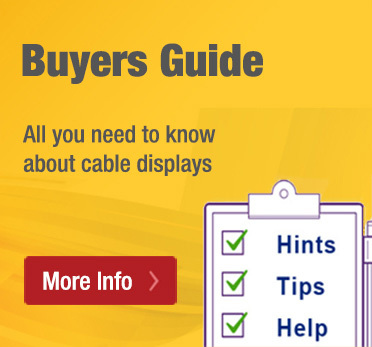 Please select one of our cable display categories below to get started. 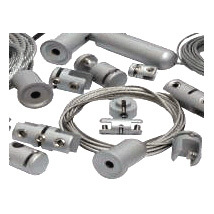 Range of cable display components including cables, poster holders, literature dispensers and clamps. Complete your cable display kit with our components. Range of cable displays with poster holder pockets. Options for portrait and landscape. Choose floor to wall, wall to wall or floor to ceiling in a range of sizes. Display your literature as part of a cable display with our wide range of leaflet dispenser and cable kits. Range of popular sizes with 3 different fixing types. 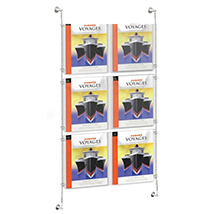 Wide range of cable display systems combining poster holders with leaflet dispensers. 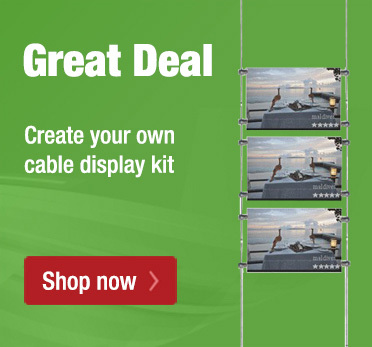 Create a complete wire cable display with our great value combination kits. Stylish freestanding cable displays with a range of graphic size options. 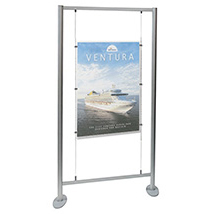 Sturdy feet and frame construction make these displays ideal for window fronts or in-store promotions. Highlight your window display with our LED light panel poster pockets. 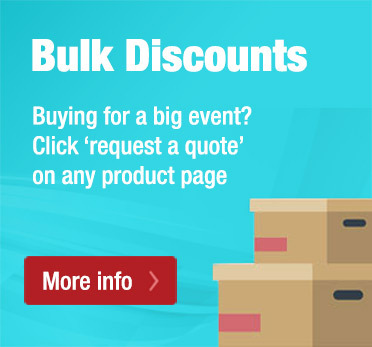 Available in a range of sizes to fit popular poster sizes, ideal for estate agents. Eye-catching rotating window displays. 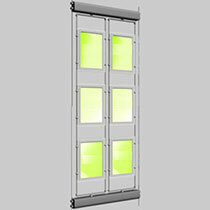 A powered motor rotates the panels enabling you to display twice as much window advertising. Includes window display lights. Cable displays, suspended cable displays, wire window display kits. We have carefully selected our range of cable display components and kits to give you a system no matter the requirement. 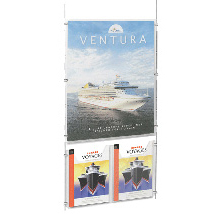 We have a range of cable display poster pockets and leaflet dispensers that can either be bought individually alongside our cable display kits or as a ready-made kit, saving you the hassle and giving you great value for money. Our cable display systems include steel cable wires, heavy duty clamps and the panels themselves, which simply attach to the clamps and hold in place. Cable displays are a great way to improve your window display, in-store promotion, information point or use at your exhibition stand to provide an eye-catching advertisement. Cable display systems from Discount Displays. We also have a dedicated cable displays website. What are cable displays used for? 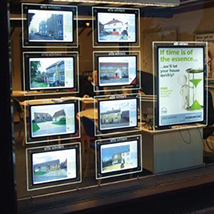 Cable displays are ideal for wall and window displays, you may well have seen them used as estate agent displays, in travel agents windows and in shops as retail displays. They offer a cost-effective and versatile way to display posters and literature in offices, retail spaces, opticians, dentists and doctor’s surgeries. The main component of a cable display is the wire kit itself. This comprises a stainless steel cable, 4m long for floor to wall and floor to ceiling, 2m long for wall to wall, that can be cut to suit your shop window or office wall. Cables are 1.5mm thick but can support up to 120kg. The cable has a bottom fitting with a tensioning spring and a top fitting. The type of top and bottom cable display fitting depends on whether you want to fit the cables from the floor to ceiling (the most common) the floor to a wall or wall to wall. Click here to see images of these fittings. Once you have fixed your window display wire cables you are ready to fit your poster holders and literature dispensers. 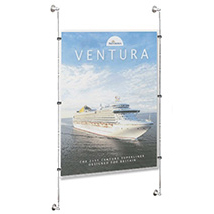 These are attached using cable clamps which can be attached anywhere along the wire length giving you the flexibility to position poster holder where you want. Cable clamps only take a couple of seconds to fit using an allen key. Cable clamps are available to take a single or double poster holders in small or large sizes. Larger sized clamps take panels up to 8mm thick. They cost more, are slightly easier to fix and look more imposing.